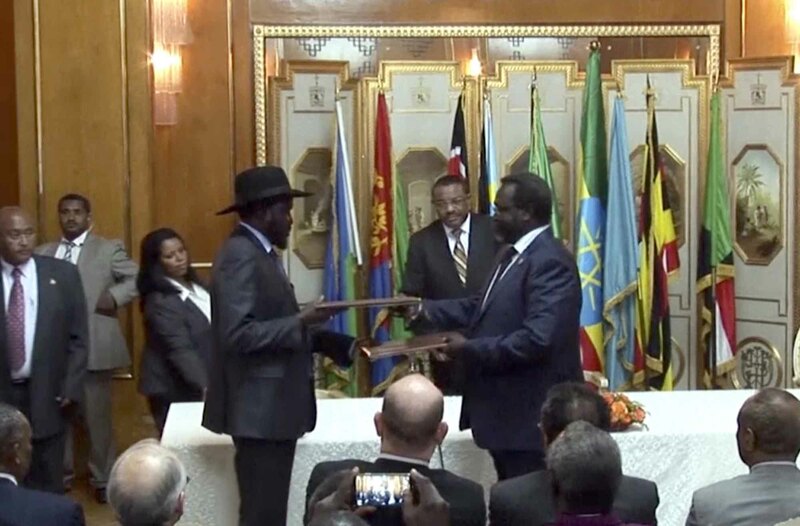 The 60 day deadline to form a transitional government of national unity agreed to by President Salva Kiir and Opposition leader Riek Machar at the IGAD Heads of State summit on June 10 has expired. Little progress has been made on substantive issues due to an overwhelming lack of commitment on both sides to reaching a negotiated settlement. Vicious fighting, including the targeting of aid workers based on ethnicity, has continued, even as the parties discuss security arrangements in Addis. On Wednesday, regional heads of state will meet once again for an extraordinary summit to discuss the dire situation in South Sudan and the looming threat of the worst man-made famine the world has seen in decades. On the heels of strong statements made at the U.S.-Africa Summit, the regional meeting may produce some movement on promised punitive measures against those that continue to undermine negotiations, which the Enough Project has been pushing for months. Ethiopian Prime Minister Hailemariam Desalegn promised that the region would take "strong action" to end the human suffering in South Sudan. While “sanctions-fatigue” has set in on Russia, Syria, CAR, and a host of other conflicts, the vulnerability of South Sudan’s political elites to asset freezes and travel bans is perhaps unparalleled. Due to the massive corruption permeating the system, billions in oil revenues have failed to benefit the country's infrastructure. The country's financial institutions are so weak that elites generally keep their assets abroad. Elites maintain homes, bank accounts, and their families in neighboring countries, such as Kenya, Uganda, and South Africa. But in order to make sanctions effective, they should be used as an incentive rather than as a purely punitive measure to avoid collapsing negotiations. In order to advance the peace process, designations should be based on clear criteria for undermining the peace process, such as obstructing humanitarian assistance, and perpetrating atrocity crimes. In Mali, for instance, sanctions imposed by the West Africa regional organization ECOWAS on coup leader Amadou Sanogo and his backers were immediately lifted once a transitional framework agreement was signed. The United Nations Security Council, which is visiting South Sudan this week, released a strongly worded statement that they are prepared to follow-up regional action with targeted sanctions of their own. Only once the cost-benefit analysis has shifted will the parties to the conflict become truly invested in peace.